I Want My MTV. Think Small. Just Do It. Got Milk? Where do these phrases come from? 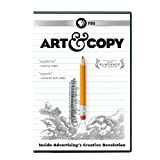 ART & COPY introduces the cultural visionaries who revolutionized advertising during the industry s golden age in the 1960s by creating slogans to live by and ads we all remember. You may have never heard of them, but pop pioneers Lee Clow, Hal Riney, George Lois, Mary Wells, Jeff Goodby, Rich Silverstein, Phyllis K. Robinson, Dan Wieden, and David Kennedy have changed the way we eat, work, shop, and communicate often in ways we don t even realize. From the introduction of the Volkswagen to America to the triumph of Apple Computers, ART & COPY explores the most successful and influential advertising campaigns of the 20th century, and the creative minds that launched them.